Oct. 17 is National Pasta Day and several businesses are celebrating with deals and freebies to load you up with as many carbs as you can handle! Biaggi's Ristorante Italiano: Join Club Biaggi's at www.biaggis.com/club-biaggis for discounts. 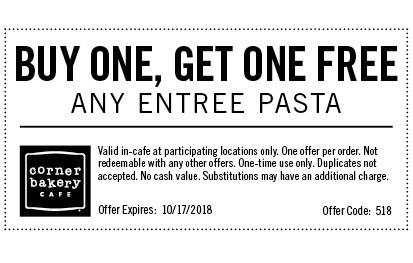 Corner Bakery Café: Buy one pasta entrée, get one free Wednesday with a coupon. One offer per order and dine-in only at participating locations. Jewel-Osco: Grab a free box of Signature Select Pasta on Wednesday by saying "Lots a Pasta" at the register to redeem. Limit one per customer.